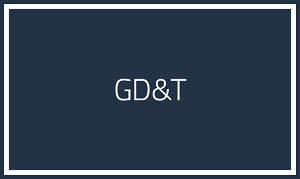 GD&T is a tool that effectively communicates the design intent for manufacturing and inspection. It is governed by the technical standard ASME Y14.5M-2009. The course introduces participants to the GD&T methodology. The course provides a working knowledge of the correct interpretation and application of each symbol, general rules, the datum system, and ‘bonus’ tolerance and highlighting some of the changes in the updated Y14.5 standard. The material is reinforced with some practical exercises.